Why I am scared of most life coaches and why you should be too. 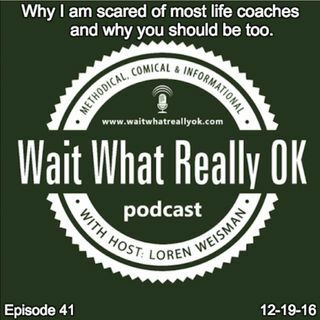 Wait What Really OK Podcast Episode 41 hosted by Brand Precision Marketing Strategist and Counselor, Loren Weisman discusses the concept of the life coaching methods that are far from helpful and don’t deliver the results or the conversions in the long term. Digging a little deeper in to the concept of life coaching and how the bigger percentages of life coaches are hurting more than helping, we dig in to the ... Más informaciones questions, the answers, the results and the issues that show up all too often with those that really have no place in coaching. While this is not true for every single life coach and their are a small percentage that can be that effective and be a part of delivery the results, this is a scary world that is being taken over by those that have never been able to do anything for themselves or effectively work for others. Yet, somehow they have all the answers and all the methods for everyone. Why I am scared of most life coaches and why you should be too. WWROK Ep41 of the Wait What Really OK Podcast is available on iHeartRadio or on Spreaker. Podcast Blog Supplement for Episode 41 of the Wait What Really OK Podcast with Loren Weisman. Podcast Link Supplement for Episode 41 of the Wait What Really OK Podcast with Loren Weisman. Are your testimonials and reviews real? Prove them by linking them. Podcast Video Supplement for Episode 41 of the Wait What Really OK Podcast with Loren Weisman. Podcast Photo Supplement for Episode 41 of the Wait What Really OK Podcast with Loren Weisman.